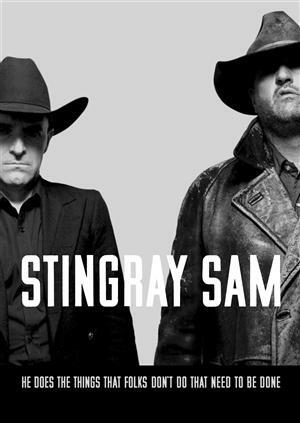 Filmmaker and musician Cory McAbee has created his second sci-fi Western musical, Stingray Sam, featuring his band, The Billy Nayer Show. In the film, Stingray Sam is reunited with his old accomplice, The Quasar Kid, and “the story follows these two space convicts as they earn their freedom in exchange for the rescue of a young girl who is being held captive by the genetically designed figurehead of a very wealthy planet.” David Hyde Pierce provides the deadpan narration, and it’s a decided homage to ‘singing cowboy’ movies and classic sci-fi, aiming for (and doing a pretty good job of hitting) that sweet spot between irony, nostalgia, and kitsch. You can watch the trailer and the first episode here. If this seems up your alley, you can also check out McAbee’s first sci-fi Western musical, The American Astronaut. The film is ‘designed for screens of all sizes;’ to start, it’s a feature-length film that’s broken into six download-friendly episodes. There’s a screening in LA tomorrow (September 15th) at 7 pm PDT, followed by a Q&A with McAbee, and it’ll be streamed live at the film site. It’ll also be screening theatres around the country and the world, and as of tomorrow, it’ll be available for purchase in a variety of formats, ranging from phone-friendly to hi-def.